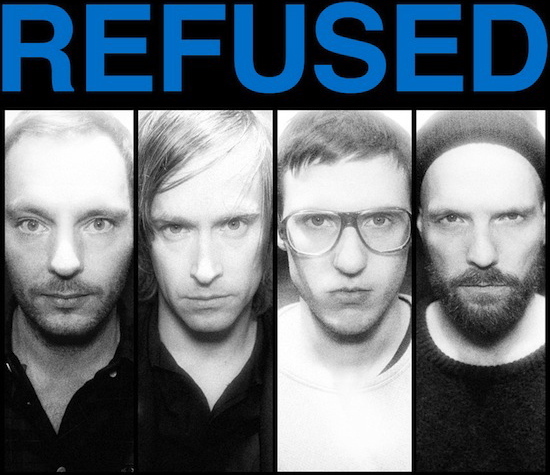 Refused has influenced more bands than you or I even know. These Swedish musicians left a mark on music that will never totally be realized in my opinion. They broke up way too early for there to be any real system to gauge how much they left their mark on people in the decade following their dispersion. In high school, these guys were kings. Their album "The Shape of Punk to Come" was mind blowing. I would have done anything to see them play but they broke up before I even had a chance. I'm gonna have to pull some strings to make it to Coachella to see them play live but I think I can do it. I have never really had the desire to go to that music festival but I figure this will be my first and last time so I might as well live it up. At The Drive-In is playing too so I figure I'll just write it off for history's sake. I mean, I flew to New York to see Texas is the Reason play for their reunion after being broken up for 10 years so I might as well keep with the theme. Plus me going to Coachella will make up for me living on an Island for 7 years with an overwhelming lack of good music hardly making its way there... this is how I'll justify it. If you're not familiar with Refused, do a little research on the world wide web and listen to "The Shape of Punk to Come" in it's entirety. You'll be glad you did. you've got great taste in music, mister. i really hope you get to go to Coachella!! wish i was going sooo bad.